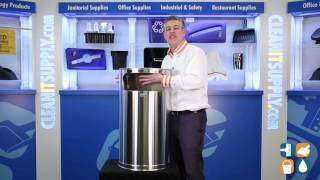 Attractive, wall-hugging design is perfect where aesthetics and space are important while the durable, fire-safe, satin stainless steel construction makes this indoor 9 Gallon Half-Round Metal Trash Can practical. 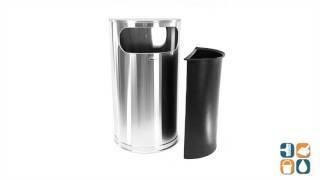 Its large 15" x 5" vinyl-trimmed opening encourages litter disposal while the lift-off body makes emptying simple and uncomplicated. Noncorrosive base ring prevents scratching of floors. Includes leak-proof rigid plastic liner that is easy to clean. ADA Compliant. Contains a minimum of 30% post-consumer recycled steel. Meets or exceeds EPA and/or LEED guidelines. Dimensions are: 18"W x 32"H x 9" Deep, 9 gallon capacity. Shipping weight: 25-lbs.